Minimalist compositions of pattern and form suggest a complex historical and cultural background in the works of Máximo González and Ato Ribeiro. Ribeiro’s hand-worked wooden quilts speak to the merging of cultures that is a primary facet of contemporary life, as well as the changing conceptions of communication and material that will shape our planet’s future. 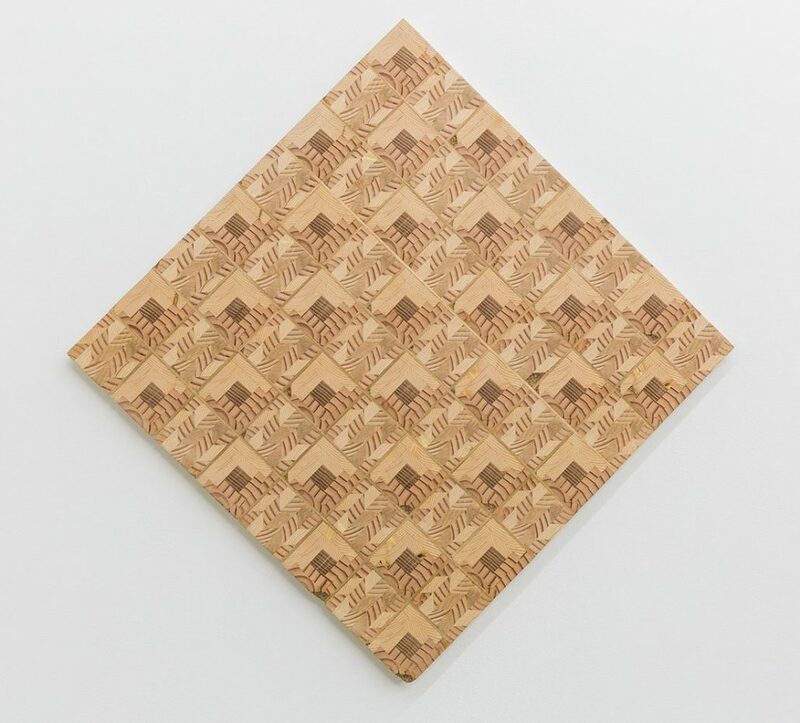 González’s works in devalued currency propose a canny political critique in the form of the subverted materials from corrupt power structures. 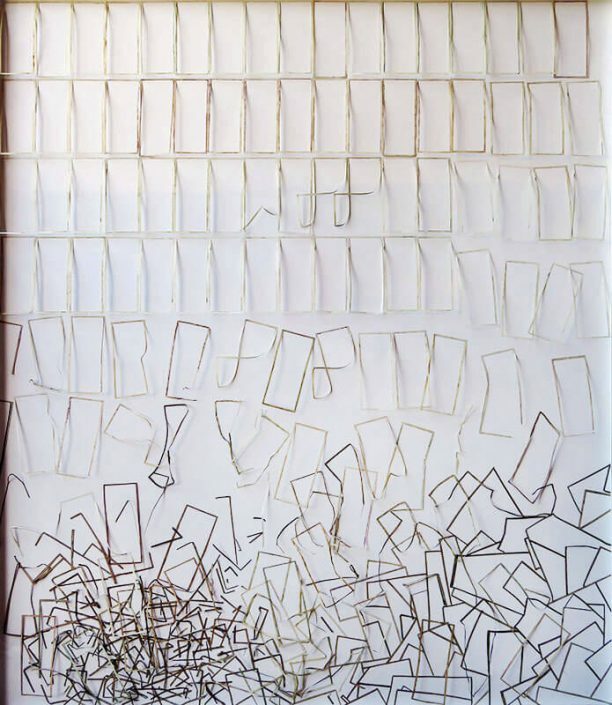 Máximo González is recognized internationally for installations composed entirely of detritus and cast-asides, and he is known in particular for his work with devalued currency. 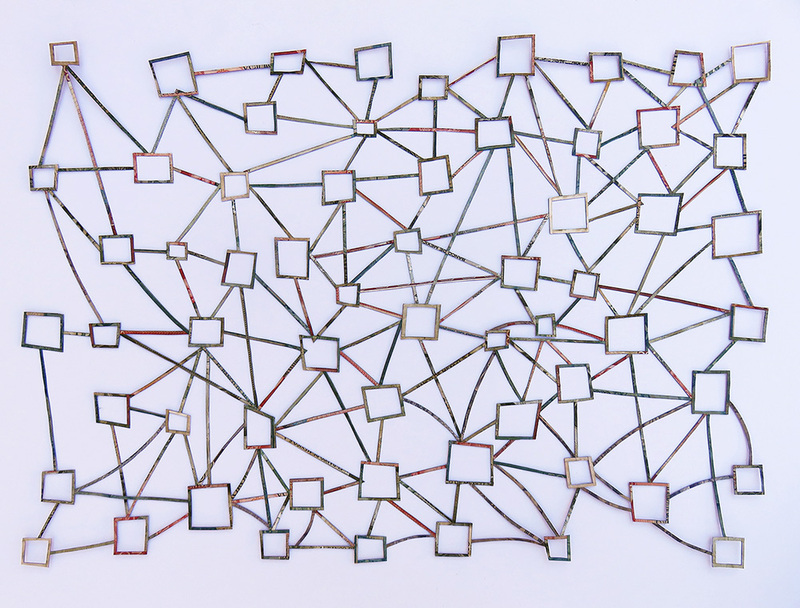 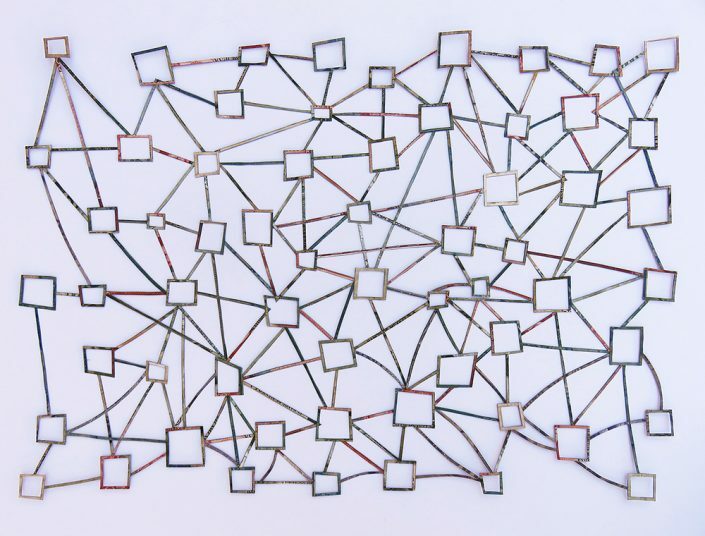 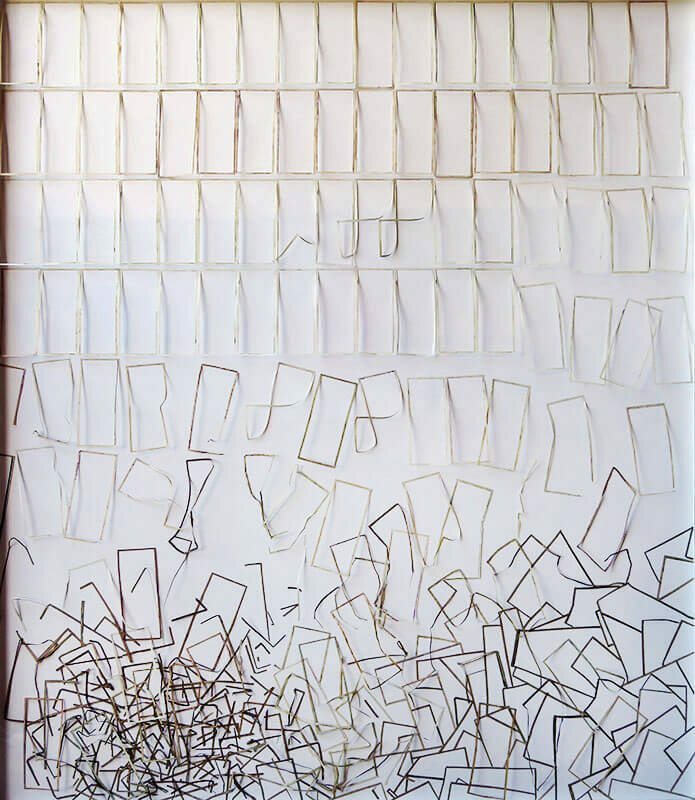 Suggesting roiling collections of empty photo frames, sisyphean mazes, and stacks of grids and files, González’s works draw attention to both the emptiness within these structures and the aimless bureaucratic paperwork that predicates them. 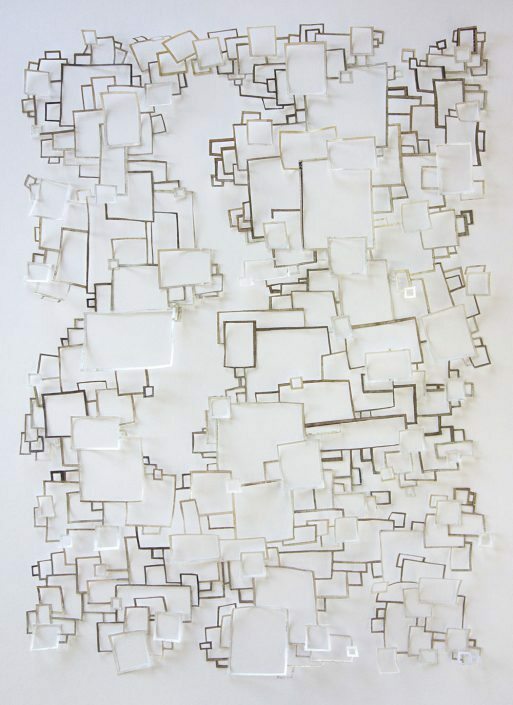 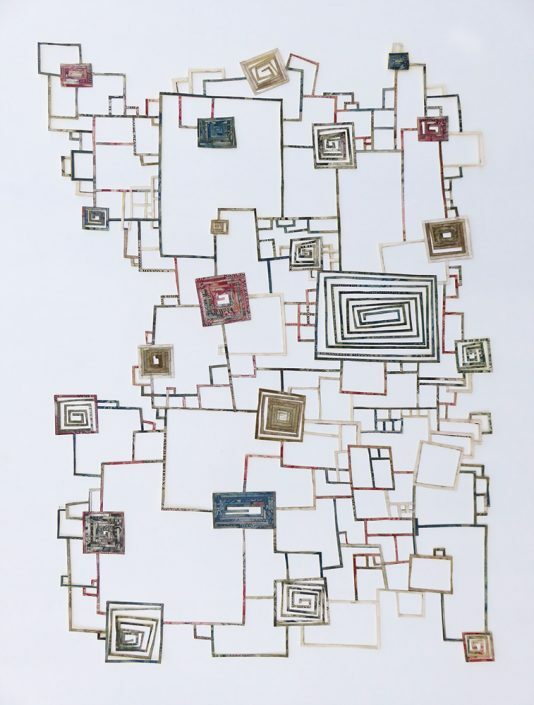 The ability of the artist to repurpose paper evidence of corruption and mismanagement into an interrelated series of delicate and enchanting objects offers hope: despite the ravages of greed, humans continue to return to basic values of material ingenuity and aesthetic structure. 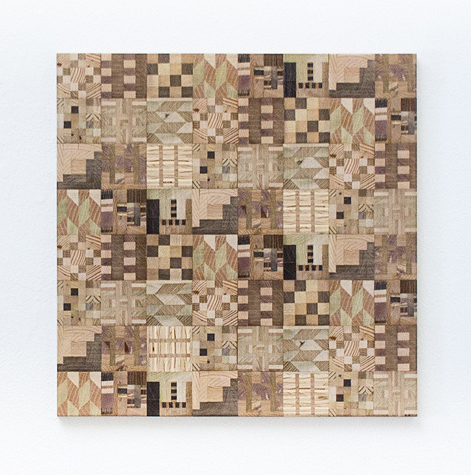 The wooden quilts of Ato Ribeiro–composed entirely of found and discarded woods–embody a vocabulary of histories and materials compiled across continents and cultures. 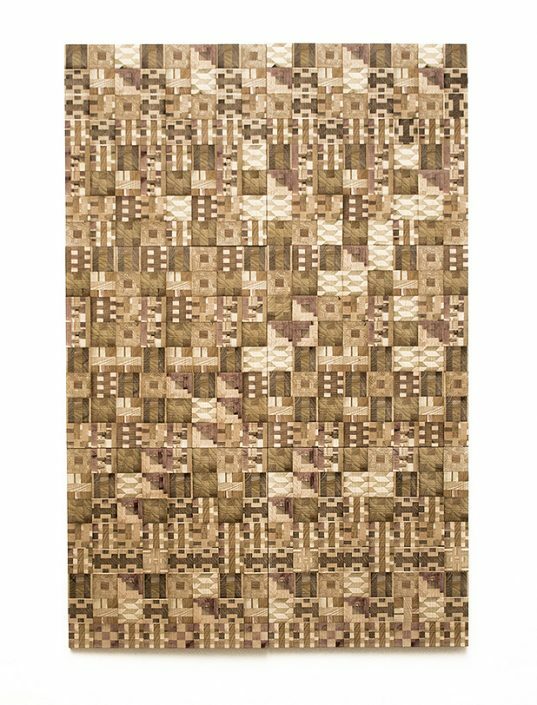 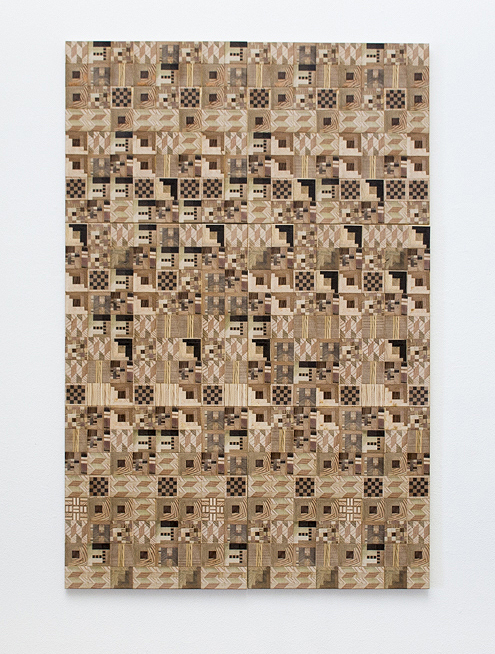 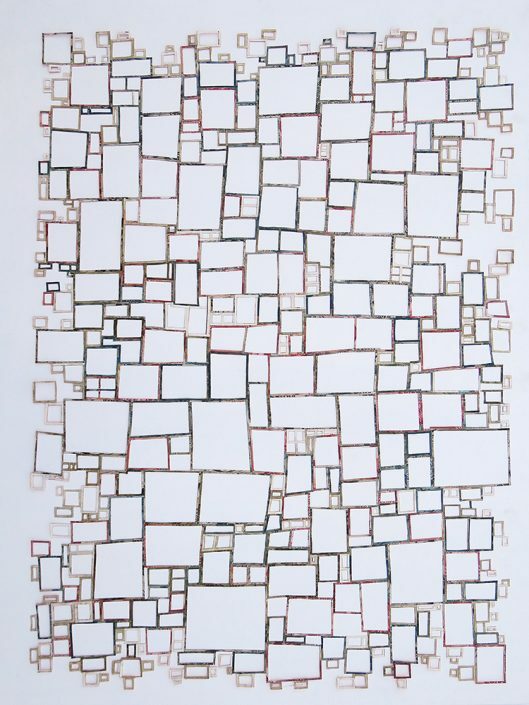 Woven of repeating shapes and grain patterns determined by both the amount of scrap wood available, and specific methods used in quiltmaking and kente-cloth strip weaving, the resulting works reveal the elegant, essential beauty of Ribeiro’s meticulously collected and catalogued scraps. 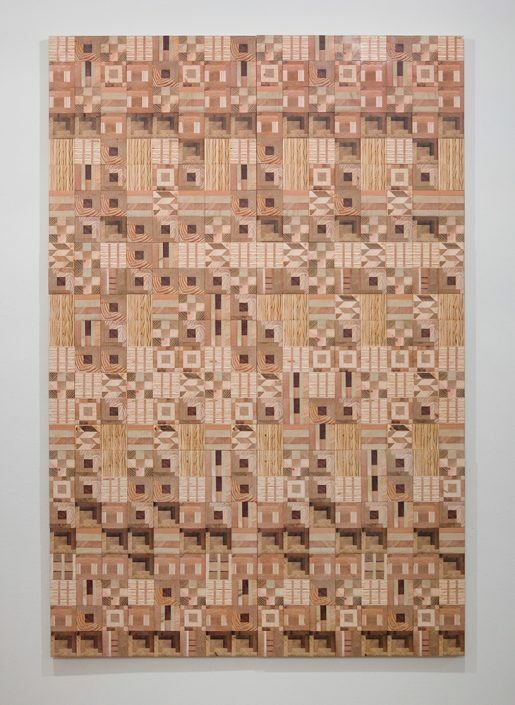 Ribeiro’s works, like the early African-American quilts that influence them, are both specifically defined and dynamic, containing forms that shift and expand as our eyes adjust to repeating variations in line and shape. 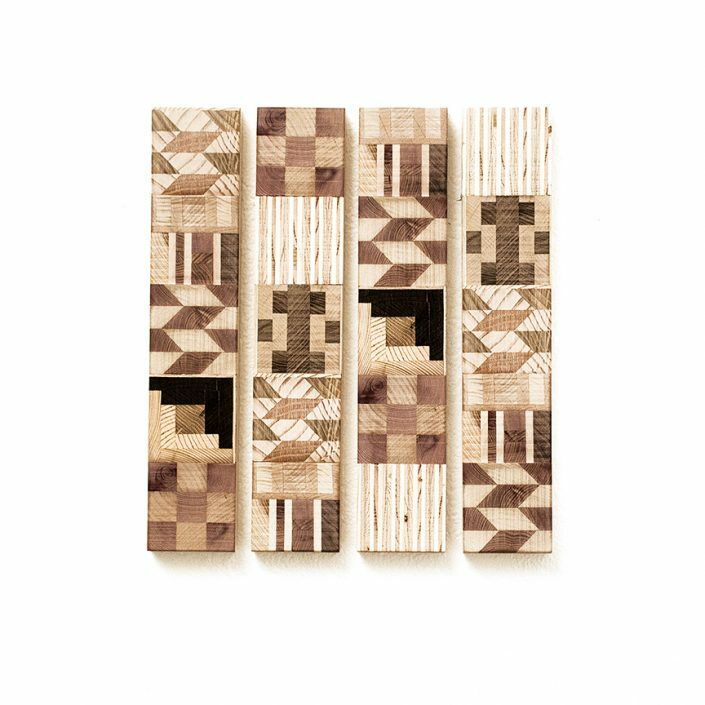 Ribeiro fashions this connection in marqueted geometrical forms that draw inspiration from both African kente patterns and the quilters of Gee’s Bend, Alabama. 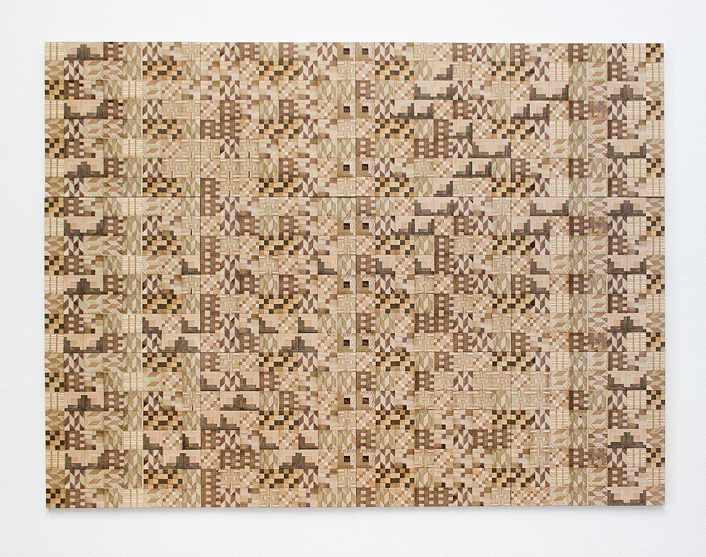 With their intentional use of materials and expansive vocabulary of symbols and patterns, Ribeiro recognized in “the complex modes of communication embedded within these textiles” a parallel to his own experience. 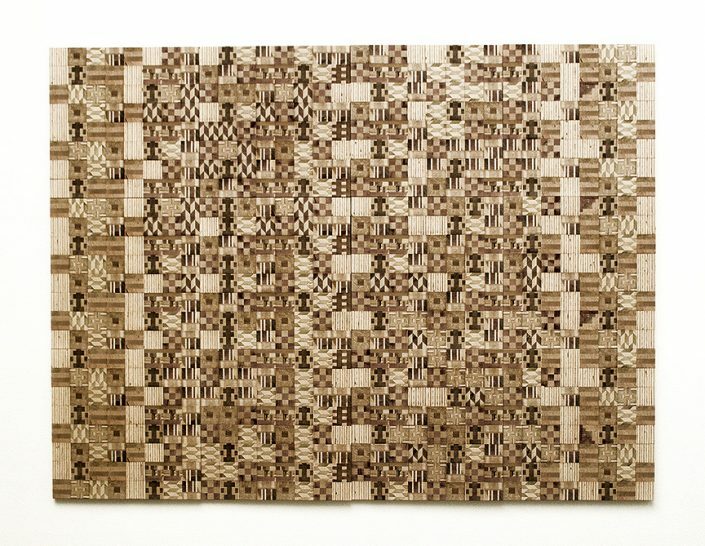 In the works’ graphic elements lives a coded language, contemporary evidence of a shared heritage that is independent of words and has existed for centuries.